It has been ages since you saw the Crazy Canvaswork Cushion – I got stuck and fed up with it and threw it aside in a huff, but since I’ve now sorted out the frustration I can cry “Onward and forward!” and show you Section Ten, which against my original idea, mentioned in Part Six, of choosing a horizontally striped pattern, I chose a basketweave bargello pattern. This is a pattern I have been longing to use and never had a use for. What hadn’t quite registered with me was the scale of the pattern. It’s easy to work, although getting the colour progression right is a little tricky when you’re stash-busting! I did maintain the orientation of the dark to light in both of the colour sections, but I wonder whether the light squares are too light. One of the advantages of this project is that it will give me references in the future to help me to remember what I need to think about when I choose to use some of these stitches and patterns. Section Eleven was the problem that caused me to make disgusted noises and set the whole thing aside. 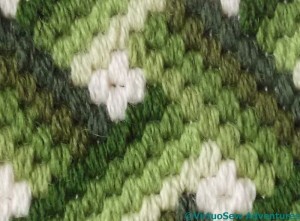 I started the section using and interlocking and crossing stitch, but it didn’t cover the canvas thoroughly enough, I didn’t enjoy working it, and it was using a lot of thread. Now, I want to use up as much of my thread as possible, but I also want the shapes and sizes to balance nicely. All of this made me downright grumpy with the whole thing. Finally, over Christmas (having packed everything else away so I would have to solve the problem!) I unpicked the stitch I didn’t like, and started again, leafing though my books of stitches and patterns. Finally, I chose Plaited Stitch. It creates the horizontal stripes I had first thought of for Section Ten, but it is a diagonal stitch, so it contrasts with the Section Ten I finally did, and it is a crossed stitch, which contrasts with the diagonal stitches and straight bargello stitches of sections Nine and Ten. Nice to see your crazy-canvaswork continuing. 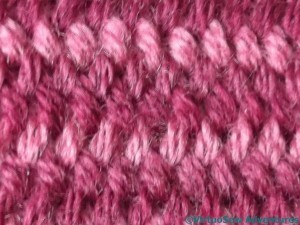 I like the plaited stitch. The bargello basketweave is impressive. If you feel it is too bold and distracting you can replace the white with the mid green that is colour two on one bar and colour three on the other (or something similar, such as mid-greenish-grey). That will leave the basketwork structure showing, but make it less obtrusive. I suspect that you will find you won’t need to make any changes, and the pattern will fit in happily when all the other sections are in place. But it’s an option if you need it. I love it that you didn’t give up!! In the past I have been known to do the ‘stash in the cupboard’ thing only to find it, still stashed and unfinished, a few years later. I’m glad you rescued your work — its going to be stunning when its finished. sometimes putting something down and revisiting it after awhile helps see things in a different light. do hope you keep on with this one. i love the look. Good for you! I have a feeling that we’ll see this finished soon! I’d forgotten about this project! So nice to see it again. 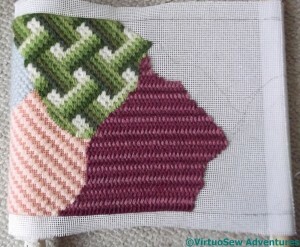 The basketweave bargello is a fab pattern, it has such depth to it. A New Year and new stitches! I love the plaited stitch and ten out of ten for perseverance! 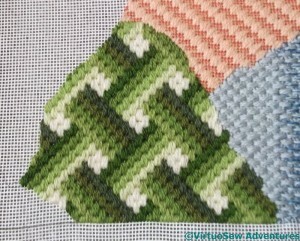 The Bargello is impressive and it will be interesting to see when it is all finished whether the very light is too light. So looking forward to the finished article. a huff? you? I don’t believe it……it is looking beautiful Rachel, so the huff was at least productive. Then again it looked beautiful before the huff!! The basketweave is very effective. I can imagine it looking good on a set of dining chairs. 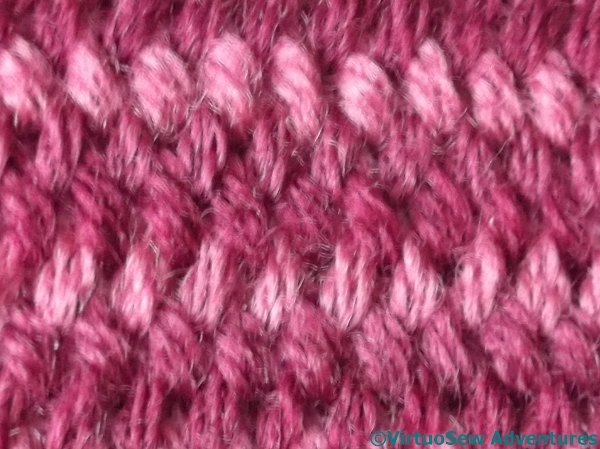 The plaited stitch is lovely – looks beautiful in the close-up. Hope it is continuing to progress well. Oh how many times have I done the same thing, thrown that piece aside swearing to never look at it again. Somehow or other when you come back to the piece it all just sort of sorts itself out. Looking good. It looks really good! I would rather put something aside for a while if it isn’t going well, rather than soldiering on and not enjoying it. Very pretty gradation of color. Visiting from Elizabeth’s blog…love this piece!